That though brings an end to today's game between Spain and Russia. I hope you have enjoyed our coverage. I have been Brandon Sayer taking you through this game, but until next time have a good evening. That is truly unbelievable as Russia won the game 4-3 on penalties and now will face the winners of Croatia or Denmark. Spain will be devasated but in truth they didn't deserve to go through. Aspa's turn for Spain. He misses and Russia advance to the quarter-finals of the World Cup. Cheryshev steps up for Russia. He scores to make 4-3 to Russia after four penalties each. Drama. Ramo's turn for Spain. He scores. 3-3. Golovin's turn for Russia. He scores and makes it 3-2 to Russia in the shootout. Koke's turn for Spain. He misses as Akinfeev saved his weak spot kick. It stays 2-2. Ignasevich's turn for Russia. He scores. 2-2. Pique's turn for Spain. He scores and makes it 2-1 to Spain. Russia's turn. Smolov steps up and scores. 1-1 in the shootout. Spain to take first. Iniesta steps up and scores to make it 1-0 to Spain. Both sides couldn't be separated in 120 minutes but they will have to be when it comes to penalties. Who will hold their nerves? Stay tuned and find out! We are heading to penalties in Moscow. What drama. 120+1' - The referee has blown his whistle to end the second period of extra time. Spain 1-1 Russia. 120' - The referee has decided to add on one minute at the end of the second period of extra time. 109' - Finally a bit of invention from Spain as Rodrigo spinned his defender before running at the Russia defence before forcing Akinfeev into a very good save. That's much more like it from Spain. 106' - The referee has blown his whistle to begin the second half of extra time. Game on! That first half of extra time really had nothing as both sides seemed to be getting a bit tired. Stay tuned as we bring you the second half live in a few minutes! 105+1' - The referee has blown his whistle to bring an end to the first half of extra time. Spain 1-1 Russia. 105' - The referee has decided to add on one minute at the end of the first half of extra time. 104' - Spain substitution: Asensio is replaced by Rodrigo. 97' - Russia substitution: Kuzyaev is replaced by Erokhin. 91' - The referee blows his whistle to begin the first half of extra time. That second half was pretty much a non event as Russia managed to keep Spain at bay but most of their players are dead on their feet. What will happen in extra-time. Stay tuned as we bring it to you next! We are heading into extra-time in Moscow. 90+4' - The referee has blown his whistle to end the second half. Spain 1-1 Russia. 90' - The referee has decided to add on four minutes at the end of the second half. 85' - Great save from Akinfeev! After long periods of nothing from Spain, they came alive as Iniesta forced Akinfeev into a very good save from the edge of the box and from the follow up, Akinfeev saved a shot from Aspas. Great from the Russian skipper. 80' - Spain substitution: Costa is replaced by Iago Aspas. 71' - Zobnin receives a yellow card for a late tackle on Alba. This game at the minute is very well poised and could go either way. 70' - Spain substitution: Nacho is replaced by Carvajal. 67' - Spain substitution: Silva is replaced by Iniesta. 65' - Russia substitution: Dzyuba is replaced by Smolov. 63' - Spain are finding this Russia side very difficult to break down at the minute and that is given the hosts some confidence to go forward and try to create some chances. 61' - Russia substitution: Samedov is replaced by Cheryshev. 54' - Kutepov receives Russia's first yellow card of the game for a deliberate tug back on Isco. 46' - The referee has blown his whistle to begin the second half. Game on! 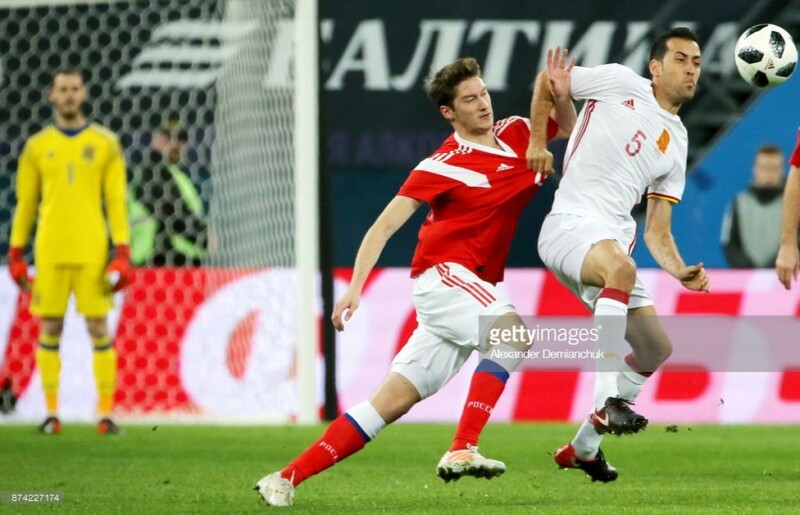 Half-time substitution for Russia as Zhirkov is replaced by Granat. Well we have a game on our hands as Dzyuba's goal from the penalty spot just before half-time has really thrown a spanner in the works for Spain who took the lead earlier on with an own goal from Ignasevich. We will see what Spain will respond with in the second half. Stay tuned as we bring it to you live in a few minutes time! 45+2' - The referee has blown his whistle for half-time. Spain 1-1 Russia. 45' - The referee has decided to add on two minutes at the end of the first half. 42' - Goal for Russia! Dzyuba scores from the penalty spot. The striker had to hold his nerves and he did as he sent De Gea the wrong way to equalise. Now then we have a game. 40' - Penalty to Russia as Dzyuba's header was handled in the box by Pique who received a yellow card for his troubles. 36' - Finally Russia have their first decent chance of the game after Dzyuba headed the ball to Golovin in a good area in the box but the winger's curled effort just went wide of the goal. Much better from the hosts. 30' - Russia though have actually had their best spell in the game without creating any chances but at least they are trying to show something going forward. 19' - Spain are playing really well at the moment with Isco and Silva have free roles in the team and this is casuing the Russian players to struggle to get the ball and it only seems a matter of time before Spain score another goal. 12' - Goal for Spain! Ignasevich has put the ball into his own net to give the Spain the lead. The goal came from a free kick which was delivered by Silva which was hit towards Ramos, who forced the Russian defender to hit the ball into his own net. That's just what Spain would have been hoping for in the game. 4' - As expected, Spain have had most of the ball so far but a good run from Golovin gave Spain a scare just now but his cross was blocked by Pique who had to get across quick to the winger to sniff out the danger. 1' - Referee Björn Kuipers has blown his whistle to begin the game. Game on in Moscow! Russia starting XI: Akinfeev; Fernandes, Kudryashov, Kutepov, Ignasevich, Zhirkov; Samedov, Kuzyaev, Golovin, Zobnin; Dzyuba. Spain starting XI: De Gea; Nacho, Piqué, Ramos, Alba; Busquets, Koke; Asensio, Isco; Silva; Diego Costa. The all important team news is in from the Luzhniki Stadium. Stay tuned as we bring it to you next! What happened the last time these two sides met? Well, these two sides only met a couple of months ago in November 2017 in an entertaining 3-3 draw. Jordi Alba gave Spain the lead after just nine minutes before a penalty from Sergio Ramos doubled their advantage. However, Fyodor Smolov did pull one back just before half-time for Russia. The hosts managed to get themselves level just six minutes into the second half through Aleksey Miranchuk but Ramos converted his second penalty of the match to put his side back in front. Spain were again unable to hold onto their lead though, as Smolov scored his second of the match to ensure his side picked up a shock result. As for Russia, you would have to say that their key player is still Golovin. There are reportedly a number of clubs across Europe interested in signing the 22-year-old CSKA Moscow winger this summer, including Premier League sides Manchester United and Chelsea, and it is clear to see why. He was instrumental for Russia in their opening two matches and has the ability to both find the back of the net himself and create plenty of chances for his teammates. He should be fresh and raring to go after being rested in Russia’s previous match so he is certainly one for Spain to watch out for and be aware of. So who are the key players for both sides? There is no doubt that the key player for Spain so far in this tournament has been 26-year-old Real Madrid playmaker Isco. He has been dictating play for the 2010 champions and this is backed up by his statistics, as he has created nine chances in the tournament so far. He is yet to register an assist which is surprising considering the amount of chances he has created for his teammates. He has arguably been one of the standout players in Russia so far. With their passage through to the knockout stages already secured, the likes of Golovin were rested for Russia’s final group game against Uruguay. However, their performance was still very disappointing. Luis Suárez gave Uruguay the lead after just 10 minutes before an own-goal from Cheryshev doubled their advantage. Igor Smolnikov was sent off for Russia shortly before half-time which ultimately made it an impossible task for his side. Edinson Cavani rounded things off at the end of the game to secure a 3-0 victory for his country and subsequently forced Russia to settle for second place in group A. As for Russia, they have surprised many people with their performances at this tournament so far. They have clearly got confidence from the fact that they are the host country as this shone through in their opening two matches. They were able to comfortably beat Saudi Arabia 5-0 in their opening match, courtesy of goals from Yury Gazinsky, Artem Dzyuba, Aleksandr Golovin and a brace from Denis Cheryshev. 27-year-old Cheryshev established himself as an unlikely contender for the Golden Boot award as he scored again in Russia’s 3-1 win over Egypt in their following game. They were able to back this good performance up with three points in their following game. It was a different challenge for Fernando Hierro's side as they came up against a very well-organised and efficient Iran side. However, this was a test that Spain were able to pass, courtesy of a deflected strike from Costa in the second half. Spain did have work to do in their final game against Morocco to secure their passage through to the knockout stages, and they were able to get the job done. Goals from Isco and Iago Aspas secured a 2-2 draw which was ultimately enough to see them through. What better place to start than discussing how these two sides fared in the group stage? Well, Spain’s World Cup campaign began with a scintillating 3-3 draw against Portugal which arguably remains the game of the tournament to date. Spain would have thought they had secured all three points when Nacho’s sublime volley gave them the lead in the second half following a brace from Diego Costa. However, a hat-trick from Cristiano Ronaldo, including a perfect free-kick in the latter stages, meant that they were forced to settle for a point. They were still able to take a lot of positives from their performance, even though they did not get the result they wanted. Hello and welcome to VAVEL UK’s live minute-by-minute coverage of this evening’s World Cup last 16 match between Spain and Russia at the Luzhniki Stadium in Moscow. The game gets underway at 3.00pm, but stick around until then because we’ll have plenty of build-up to keep you entertained.